The term dental implant actually refers to a tiny, titanium post that is threaded and resembles a screw. This post is surgically implanted into the jaw bone and over a period of time (typically three to six months) will fuse with the surrounding jaw bone in a process known as osseointegration. It actually replaces the tooth root which will stimulate the bone and prevent bone loss. A piece called an abutment is then connected to the implant and then the dental crown is attached. Can dental implant replace multiple teeth? Can dental implant replace multiple teeth? Yes, if you have several non-consecutive missing teeth, we will recommend you get each missing tooth replaced with an implant-supported dental crown. If you have multiple consecutive missing teeth, then we will recommend an implant-supported dental bridge. This type of dental implant is supported by implants instead of natural teeth. Typically, we will place one implant for each missing tooth. If I am missing all of my teeth, can dental implants replace them? Yes, dental implants are an effective replacement for one or all of your missing teeth. 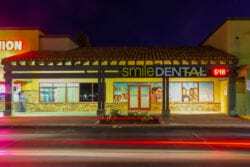 Smile Dental Group will recommend an implant-supported full bridge or an implant-supported denture. These will require anywhere from two to six surgically placed implants on the upper and lower jaw. The more implants you have, the more stable the restoration will be. 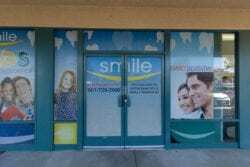 Every case is different and you will need to schedule a consultation at our Palmdale, CA dentist office where our expert dental implant dentists can perform a full evaluation and recommend a proper treatment plan. Almost anyone can get dental implants. The most important requirement is to have an adequate amount of healthy bone structure to hold the implant in place. You should also be in good overall health and have healthy gums. Are there any disadvantages to getting dental implants? Teeth implants are the best replacement for damaged or missing teeth. They will require minor surgery which comes with the typical risks of infection, inflammation and pain at the site. Implants are also the most expensive treatment for replacing missing teeth but the benefits clearly outweigh the other options such as removable restorations. If you choose to get dentures or a dental bridge, they will require costly replacement or maintenance which will add up over time. You can have your bridge or denture ready to wear in roughly three to six weeks. The entire dental implant process could take up to nine months depending on your unique case. The success of dental implants depends on many factors including the individual’s overall health, oral health, if bone loss is present and where the implants are being placed. No two dental implant cases are the same. In general, dental implants offer a permanent and secure missing teeth replacement option and hold about a 90-95% success rate. At your consultation at our Palmdale, CA or Lancaster, CA dentist office, our expert dental implants dentists will discuss all the above factors with you to help you learn if dental implants are right for you.